The 65th meeting of the International Whaling Commission (IWC) ended on September 18 after four days of tough negotiations on a number of key issues affecting the world’s whales, dolphins and porpoises. 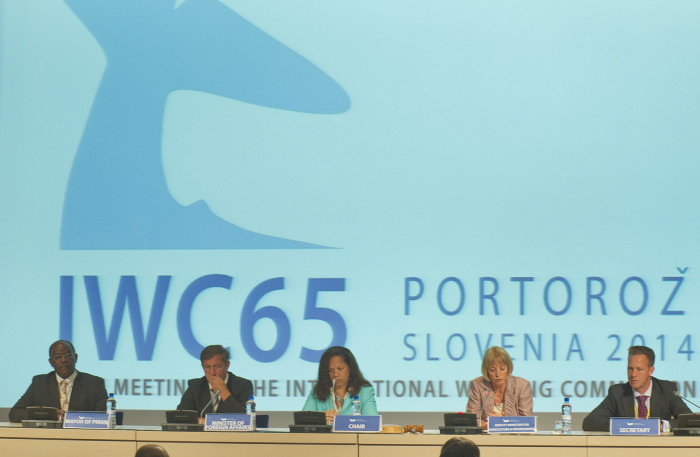 You can read a handy summary of the major decisions and outcomes of IWC65 at the bottom of this page, but I wanted to highlight some of the most critical outcomes from EIA’s perspective. Arguably the most important issue at the meeting was how the IWC would respond to the historic decision of the International Court of Justice (ICJ) in March which ruled that Japan’s special permit whale hunt in the Antarctic was “not for the purposes of scientific research”. While Japan indicated initially that it would cancel its 2014/15 JARPAII hunt and comply with the ruling, it very quickly indicated its intention to come back with a new lethal ‘scientific research’ proposal with a view to resuming hunting within the terms of the ICJ ruling in the 2015/16 Antarctic season. New Zealand submitted a Resolution to the IWC meeting to amend the way that the IWC reviews such research proposals, seeking to ensure that key elements of the ICJ decision were incorporated into the workings of the IWC Scientific Committee. As the Resolution also required special permit proposals to be considered by the Commission, which meets every two years, it would therefore prevent Japan from resuming its whale hunt until after the 2016 meeting of the IWC. New Zealand and other countries worked hard throughout IWC65 to negotiate a consensus agreement with Japan; however, it was clear that Japan would under no circumstances agree to anything that might jeopardise its chances to hunt in the Southern Ocean sanctuary next year. While the Resolution passed with a comfortable majority (35 votes in favour, just 20 against), Japan immediately stated it would not be bound by the decision – so it’s business as usual for Japan’s whaling ‘science’. EIA released a new report, Slayed in Iceland, prior to IWC65. Read and download it here. 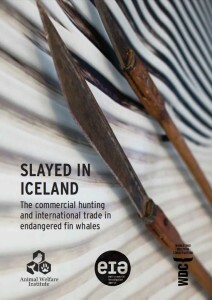 EIA was pleased to see a significant escalation in the condemnation of Iceland’s commercial whale hunt. As the Commission meeting kicked off, an EU delegation in Reykjavík handed over a formal diplomatic protest, known as a démarche, signed by 35 governments. 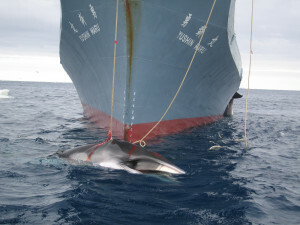 The statement called on Iceland to stop the commercial whaling and trade of fin and minke whales. Two days later at the IWC meeting, Italy raised the issue on behalf of the EU during the plenary and urged Iceland to focus on whale watching and not whale hunting. The EU statement was supported by Argentina, the US, Australia, New Zealand, Brazil, Ecuador, Chile, Peru, Columbia, Mexico, Panama, Costa Rica, Uruguay and Dominican Republic. US Commissioner Russell Smith made a particularly strong intervention, stating that the US was “deeply disappointed” and reminding Iceland that US Departments of Commerce and Interior have determined that Iceland’s whaling and trade are diminishing the effectiveness of the IWC and CITES. A very positive step forward was achieved on the second day of the meeting with a proposal from Monaco to formally increase IWC cooperation with other international bodies in order to help conserve highly migratory whales, dolphins and porpoises on the high seas. Despite opposition from the whaling countries, the Resolution was adopted with a strong majority vote, a good move towards enhancing the IWC’s work to conserve all cetaceans, not just the great whales which were historically targeted by the whaling industry. The following day saw a robust discussion about a number of endangered small cetacean species. EIA coordinated a sign-on of about 50 NGOs and made an intervention during the meeting, appealing for swift action to save the critically endangered vaquita, a small porpoise endemic to the Gulf of California in Mexico. Fewer than 100 vaquita remain and the decline in its numbers has accelerated in recent years, in part due to an illegal trade in totoaba, a critically endangered fish species. The demand for totoaba swim bladders in China is pushing the vaquita over the edge as a result of bycatch and scientists predict it could be extinct as early as 2018. The Mexican delegation spoke on behalf of Mexico and the US, announcing a joint statement of cooperation on issues of enforcement (to combat the illegal trade in totoaba), fishing gear technologies, socioeconomic measures and acoustic monitoring. The statement was followed up by many governments expressing their concern about vaquita and other small cetaceans, while a number of financial contributions to the IWC small cetacean fund were announced by the UK, Italy, Netherlands and a coalition of NGOs. The Mexican government is expected to be making an announcement very soon in response to the recent report demonstrating that this is our last chance to save the species and EIA will be following this issue very closely. • Greenland‘s request for an Aboriginal Subsistence Whaling (ASW) quota was approved. The Commission adopted a Schedule Amendment for four-year catch limits for the Greenland hunts and Resolution 2014-1, which aims to establish a more consistent, long-term approach to agreeing ASW quotas. (vote for Schedule Amendment: 46 yes, 11 no, three abstentions, two not present; vote for Resolution: 40 yes, five no, 15 abstentions, two not present). • Argentina, Brazil, South Africa and Uruguay proposed a South Atlantic sanctuary for whales. This was not adopted as it failed to achieve the three-quarters majority vote required for a Schedule Amendment (vote: 40 yes, 18 no, two abstentions). • Japan’s request for a quota of 17 minke whales for small-type coastal commercial whaling was not adopted, failing to reach the three-quarters majority needed for a Schedule Amendment (vote: 19 yes, 39 no, two abstentions). • Monaco’s Resolution 2014-2 on highly migratory species was adopted, which seeks enhanced collaboration on the conservation of migratory cetaceans with other relevant intergovernmental organisations (vote: 37 yes, 15 no, seven abstentions). • Resolution 2014-3 on Civil Society Participation and Transparency and Resolution 2014-4 were adopted by consensus. These seek to improve the transparency and working methods of the Commission and Scientific Committee. • Resolution 2014-5 on Whaling under Special Permit was adopted. This resolution aims to improve the IWC Scientific Committee and Commission’s procedures to review new and existing Special Permit research programmes in light of the International Court of Justice’s judgement against Japan (vote: 35 yes, 20 no, five abstentions, one not present). • A resolution on food security was discussed but no consensus was reached; Ghana indicated it would continue to refine the proposal during the inter-sessional period ready for presentation to IWC66. • The Commission endorsed a number of recommendations by the Conservation Management Plan (CMP) Standing Working Group, including a suggestion that the issue of marine debris is incorporated and addressed in CMPs and that the Scientific Committee should undertake further analysis on priority candidates of small cetacean populations that would benefit from the implementation of a CMP. * A memorandum of co-operation on the conservation of western North Pacific gray whales was signed by Japan, Russian Federation and the USA during the meeting. • The Commission agreed revised terms of reference and an undated Action Plan for the now renamed Working Group on Whale Killing Methods and Welfare Issues. It will work to effectively address issues related to direct hunting of cetaceans and welfare implications of other threats including entanglement, marine debris and ship strikes. • The Commission reviewed progress of the Scientific Committee’s on-going work on environmental concerns including, pollution, disease, sound and climate change, as well as its work on whale-watching, human-induced mortality and ship strikes. • The Commission received an update on the Scientific Committee’s assessment of various whale stocks. Grave concern was expressed over the small stocks of North Pacific and North Atlantic right whales and bowhead whales, where ship strikes and entanglements are significant threats in addition to the threat of trap net fishing and a proposed development project that threatens highly endangered Western North Pacific gray whales. 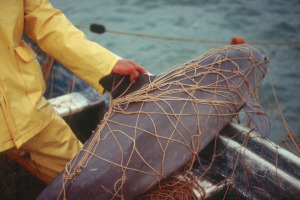 • The Commission reviewed the Scientific Committee’s work on small cetacean species and expressed extreme concern about a number of populations on the verge of extinction and subject to high bycatch rates, including the Mexican vaquita, Hector’s dolphins in New Zealand, river dolphin species in Laos, Cambodia, China and Brazil and South American Franciscana dolphins. Concern was also voiced about a number of other exploited populations including in Japan, Korea, the Okhotsk sea, the Mediterranean, Solomon Islands and Ghana. • Uruguay drew attention to the Minamata Convention, a global treaty to protect human health and the environment from the adverse effects of mercury which was agreed last year and has been ratified by over 100 States. Uruguay is seeking greater cooperation between the mercury treaty and the IWC.